Sir R. Routh 4 is employed in London to organise a Transport Establishmt. for the Crimea – Comy. Genl. Hewetson 5 to lure laborers for us in Ireland & Sir G. Maclean 6 to institute enquiry on the Continent as to their Systems now there are just so many gross jobs to give them full Pay & of course if the money is spent in that way the promotion of Working underlings cannot go on as it should – We hear our Uniform is come out Sky blue facings Silver trimmings & so I suppose you will send me a Coatee or tunic of it – I want a Coat as my frock coat, the same I had in Van D Land 7 is nearly done up – I have pants – Blue with Blk lace a pr. Greys & a pair of Black. Quant: suff. Just got so far when I found the Mail was in & I got yr. Letters 26 to 28 Decr. & while reading them grumbling at want of information about my Promotion I had the pleasure of hearing of it myself It is conveyed in a letter from The Duke of Newcastle 8 dated blank Decr. 1854 notifying to Mr. Filder the promotions here – We suppose many others are promoted as otherwise there wd. be no object in dating Smiths 9 Step on the 28 Decr. ‘54 & the rest on the 1st Jany. ’55 – Mine is a very acceptable New Years Gift to me – It makes my Pay nearly double 10 – Pay for this Month is more than £70 – not so bad you may on the Strength of it be generous & buy each of the Chicks a pair of new Shoestrings or something else handsome – A gift from the D.C.G. Do you remember when I heard of being made A.C.G. in 1846 I said in 8 years I expect the next Step & how year by year this grew to 10 & then 12 years as promoting times got more & more & yet the man has brought me nearly back to the old mark – 9 years an A.C.G. 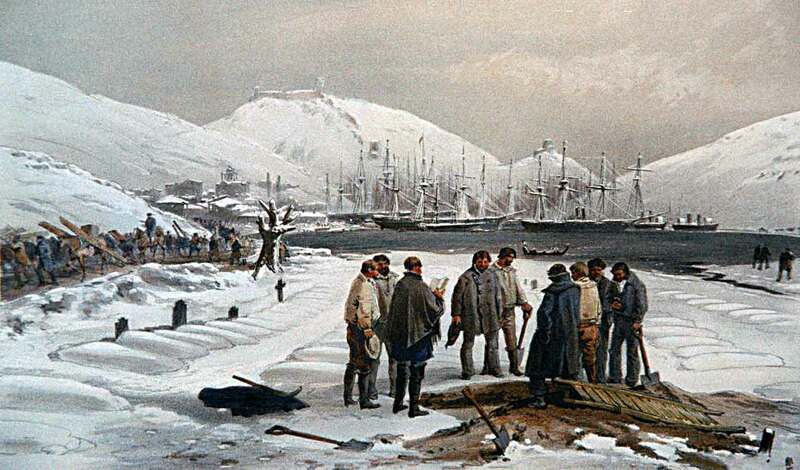 Winter Scene, by William Simpson. the kind offices of Dr. V. Krestiyannikov, at http://www.xenophon-mil.org/crimea/war/simpson/simp25a.htm, accessed 9 May 2015.